Rauvolfia capixabae I.Koch & Kin.-Gouv. Rauvolfia chaudocensis Pierre ex Pit. Rauvolfia gracilis I.Koch & Kin.-Gouv. Rauvolfia grandiflora Mart. ex A.DC. Rauvolfia ligustrina Willd. ex Roem. & Schult. 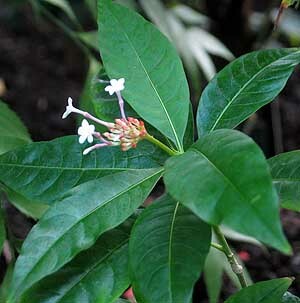 Rauvolfia macrantha K.Schum. ex Markgr. Rauvolfia praecox K.Schum. ex Markgr. Rauvolfia pruinosifolia I.Koch & Kin.-Gouv. Rauvolfia viridis Willd. ex Roem. & Schult.